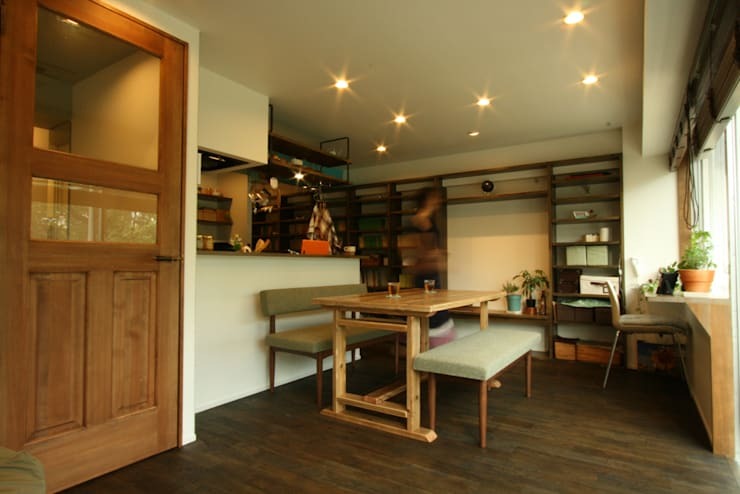 We’re off to Kanagawa, a coastal prefecture just south of Tokyo, which is where today’s ‘before and after’ piece here on homify lies in wait for us. The home? A bare and neglected apartment that hadn’t seen a touch of style in quite some time, yet had ample space just waiting for some TLC. The inspiration? The cheerful spirit of Kanagawa and its surrounding areas, as well as the architectural look of Japan. The style? A mix of both contemporary and traditional designs, with some charming touches added to the mix, as well as a generous dose of light and natural colours to calm the mind and relax the soul – perfect for meditation. That a space such as this could go unloved and unused is simply astonishing. 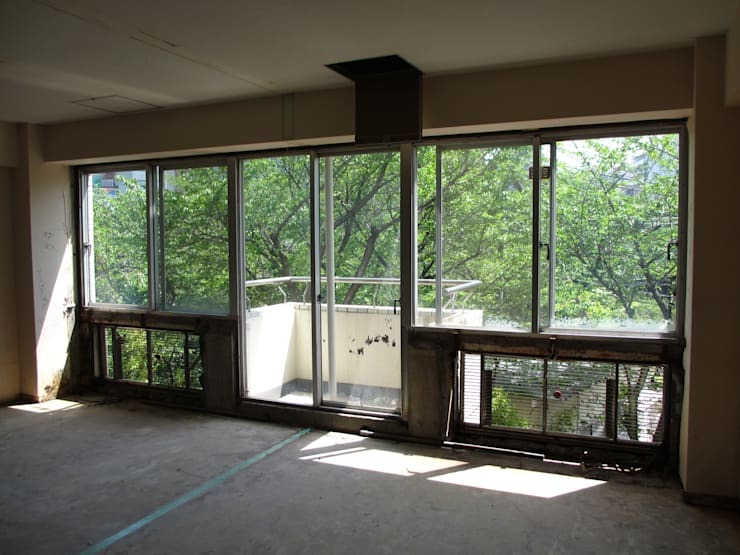 With ample legroom to spare and a gorgeous view to boot, this apartment is just waiting for a dash of creativity to transform it into something special. We knew that abundance of space would come in handy – just see how fabulously this dining area is laid out without being cluttered or looking messy. Lots of wooden surfaces and cream-coloured walls add to the charming ambience, with that fresh view an ever-present feature. Notice how the kitchen is conveniently located right behind the cushioned seating of the timber table, allowing for a smooth flow of conversing between chef and guest. Such was the abundance of space in this forgotten apartment that a casual living area could easily fit in beside the dining zone, which was exactly what was achieved. Here we see how the wooden surfaces add an exceptional attraction to the space that is wonderfully rustic and homely (such is the beauty of wood!). A snug bean bag and indoor plant add a touch of lush greenery to the warm neutrals, while the generous-sized mirror ensures some bouncing glows of light around the room – and visual spaciousness, of course. 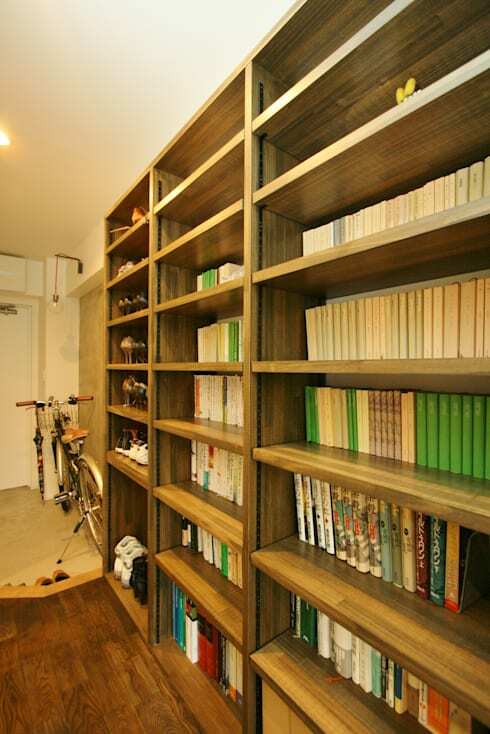 It is clear that the owner of this exquisite space has a love for old-fashioned reading (none of that Kindle business), as ample portions of timber have been converted into sturdy bookcases which adorn the one wall of the interiors. 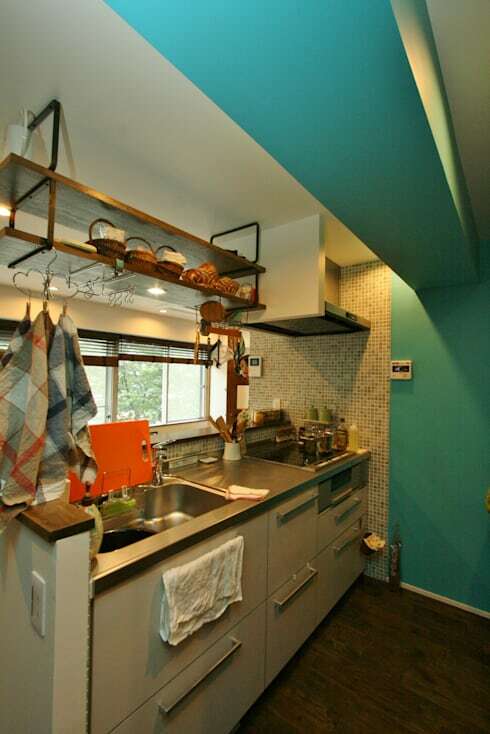 Although the kitchen takes up very little space, it presents sufficient areas for cooking and cleaning – and does so in a cheerful design that is decidedly somewhere between the modern- and industrial styles. Notice how wonderfully the mosaic finishing contrasts with the cool blue of the wall, which in turn contrasts exceptionally well with the warm colours of the textiles. One thing you can say for the homeowner: he knows how to free up even more space in this spacious apartment. Here we see how his minimalist approach to the bedroom results in an open and airy room, with rich browns, soft whites, and pistachio greens delightfully adorning the floor, walls, and ceiling without any major interruption. And since the bedroom door shares its space with a decent dose of clear glass, it means the natural lighting (and view) of the exterior landscape can gently come seeping inside. It’s safe to say that ‘straightforward’ was a major keyword in the designing of this renovated space. 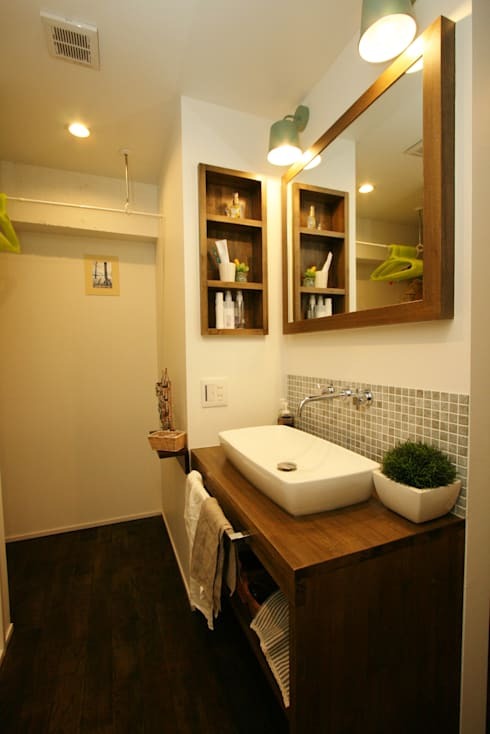 Just take a look at this bathroom: it has a simple layout, makes use of the usual elements and materials, stays far away from any excessive decorations, and it still manages to flaunt a tasteful look with organic touches. The issue of storage has been stylishly taken care of thanks to shelves, rods, and hangers, while a dash of potted greens add some fresh softness to the space. How is this for a house to nurture the mind and soul? Ready to get your “ommm” on in here? 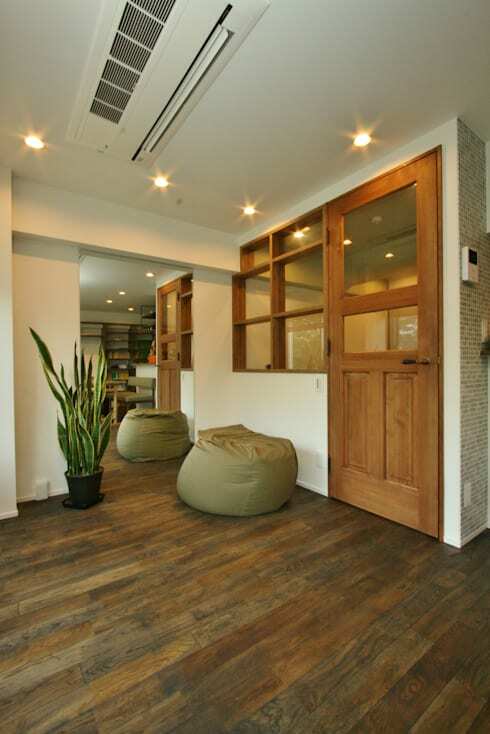 Tell us what you think of this renovated space.